Vintage aged brass Art Nouveau stamping package for "Goddess of the Sea Crocheted Choker No. 1." These jewelry pieces can easily be glued or sewn to your crochet work or used as center pieces of a lovely beading project. Mermaid shell measures 1 1/2 inches wide by 1 3/8 inches tall. These stampings are reproductions of the pieces made during the Art Nouveau period which was from 1880 to 1914, using original Art Nouveau Molds. No two pieces are alike with each piece showing different aging marks and different coloring or shading tones. 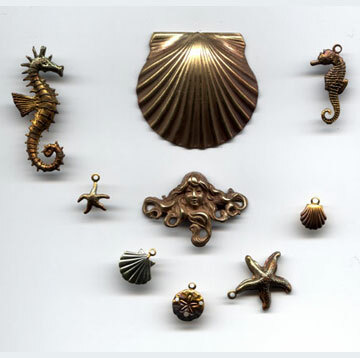 These brass pieces can also be painted using Folk Art and Deco Art acrylic paints to create wonderful affects.